Written by Sophia Beeley- Sophia is a second year veterinary student at the University of Nottingham who has a special interest in feline medicine. At home she has 9 rescued stray cats, which are a handful but a huge part of her family! In her free time she enjoys swimming and curling up with a good book! Kittens are understandably adorable, but what happens when your cat has reached an elderly age? A senior cat has different needs to a younger one, and it’s essential to monitor your pet’s health to make sure that any health issues are detected early on, and so can be managed. Make sure you organise regular vet visits, as even though your cat may seem healthy there may be underlying health issues. An important activity is checking up on your cat’s teeth. Dental disease can be very painful, and also may cause your pet to lose their appetite. If your cat starts to lose weight, drool more than usual and has particularly bad-smelling breath then it may have issues with it’s teeth and gums, and a trip to the vets is recommended. A preventative option is to brush your cat’s teeth, but as that is likely to be difficult, specialised dental treats may be a safer option! An older cat may start developing arthritis, which will affect its lifestyle. Your pet may be more reluctant to jump off heights, or generally become less active due to pain in their joints. They may also become more irritable, which is a sign of pain. Your vet will be able to provide painkillers, but a lifestyle change is also necessary. One way of reducing the strain on their bones is to make sure their food and water is at ground-level, and give them soft bedding and litter boxes with lower sides. Another very common disease in senior cats is kidney disease. The major warning sign for this is if your pet starts to drink more water than usual. Kidney disease is managed, rather than treated, and there are many specific and prescription pet foods that can benefit your cat in this situation. Keeping your elderly cat’s weight normal is essential for its health. For some cats, a more inactive lifestyle caused by age and arthritis will cause it to gain weight. This not only puts more strain on the joints, making the arthritis worse, but can also result in diabetes, which can become a condition your cat will have to live with if not discovered. Low-calorie foods and dieting are the best bet! 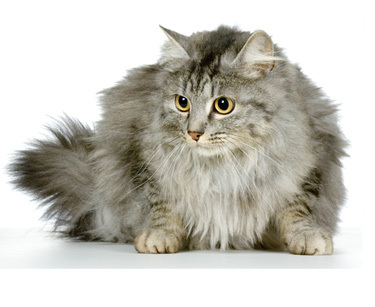 For other cats, diseases affecting the kidneys or the heart cause weight loss. Extreme weight loss and hyperactivity can also be a sign of a thyroid disorder. If you see any weight loss in your cat, you should go to the vet, as this can be serious. Special pet food for specific conditions can be bought, which will help maintain your pet’s health. Aging is a natural process and your cat will greatly benefit from you as an owner making small adjustments to accommodate your pet’s changing lifestyle. And never forget, your pet may be older in years, but that doesn’t change it’s personality and character and they could easily be around for many more years!